PRODUCT: 1/4" X 3" ZAMAC HAMMER SCREW NAILIN ANCHOR, MUSHROOM HEAD WITH #2 PHILLIPS TYPE SCREW. 100/BOX. PRICE/BOX. 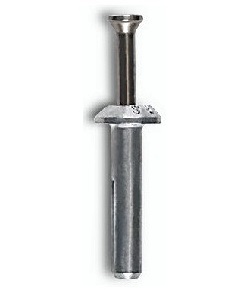 DESCRIPTION: The Zamac Hammer-Screw is a unique, one-step drive anchor featuring a Phillips type head and a screw thread for use in concrete, block, brick or stone. Its formed with a body of corrosion resistant Zamac Alloy and a zinc plated carbon steel drive screw (or optional Perma-Seal coating). The Zamac Hammer-Screw is designed to provide a removable anchor with higher tension load capacity. General Applications: Roof Flashings, HVAC and Mechanical Attachments, Brick and Masonry Anchorage, Electrical Fixtures, Signage, Drywall Track, Surveillance Equipment.